El Niño is a warming of the Pacific Ocean that occurs along the equator between South America and the Date Line and can influence the storm track over the West. 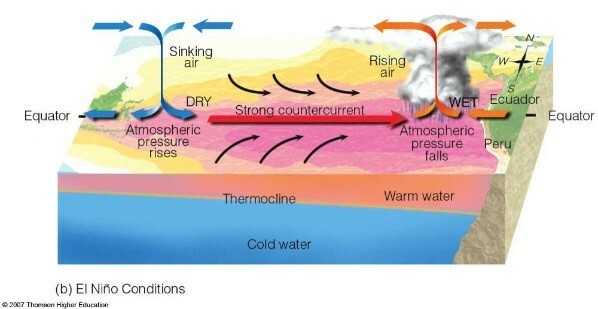 El Niño conditions do not “cause” individual storms but rather influence their frequency and characteristics. 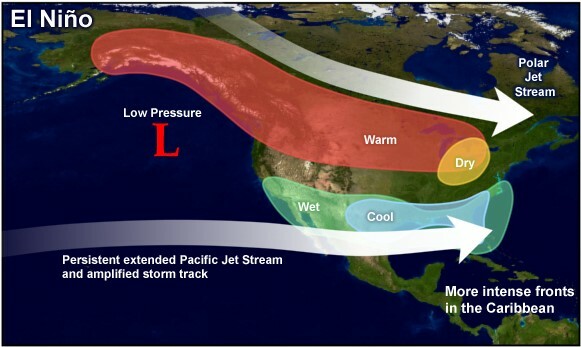 El Niño is typically associated with wetter than normal conditions along the southern third of California eastward following the U.S.-Mexico border and drier than normal conditions in the Inland Northwest and northern Rockies. What is the El Niño Outlook? A strong El Niño is predicted during winter 2015/16. The official NOAA outlooks for Dec-Jan-Feb temperature and precipitation for the West reflect the development of a strong El Niño during this period. There is a 50% chance that winter precipitation totals will be in the top 33% of historic values across far southern California, Arizona, and New Mexico. These outlooks are likely to change as NOOA tracks the progress of El Niño and other climate variables in the coming months. This El Niño event is forecast to rival previous strong El Niño events, such as 1982/83 and 1997/98. What is the City doing to prepare? The City of Riverside has existing plans, procedures, equipment, facilities and staff at the ready for all types and degrees of emergencies and disasters. Specifically in response to the El Niño forecast, the City has assembled an El Niño Preparedness Team who has been commissioned to; Prepare an El Niño Concept of Operations Plan, Procure Emergency Equipment and Supplies; Hasten the Clearing of and Maintenance of the City’s Flood Control Facilities; Hasten the Clearing of and Maintenance of the City’s Power System and Infrastructure; and all other activities vital to the preparation for and response to the effects of El Niño. Additionally, the City is coordinating its preparedness efforts with County, State, and Federal emergency management agencies. The City’s Office of Emergency Management is charged with the day-to-day planning efforts and coordination activities with these other levels of government. 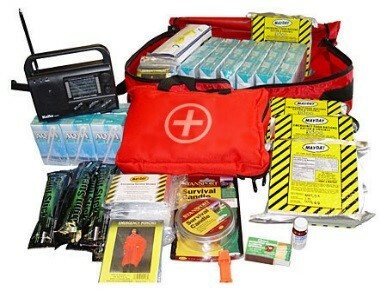 Taking steps now to prepare will go a long way towards your personal safety and that of your family during the forecasted El Niño winter weather. Check your homeowner’s or renter’s insurance for flood insurance coverage. If none exists, purchase. Drinking water, stored in closed clean containers. Allow one gallon of water per person per day for at least three days. Keep your car fueled (3/4 to a full tank). Adopt a Drain to help in the City's efforts to prevent flooding. Clean and maintain house rain gutters. Clear private drainage ditches, swales and yard drains. Keep yards clean and free of debris to prevent debris flow into City storm drains. Install groundcover, plastic sheeting or other protective measues on hillsides to prevent soil erosion. Install sandbags or straw wattles to prevent mud and debris flow onto roadways and storm drains. Avoid areas that are subject to sudden flooding. Do not try to cross a flowing stream where water is above your knees; you may be swept away by strong currents. Do not try to drive over a flooded road; you may become stranded and trapped. Do not “sightsee” in flooded areas or enter areas blocked off by local authorities. Avoid unnecessary trips. If you must travel, dress warm and advise others of your destination. Use the telephone ONLY for emergency needs or to report dangerous conditions. Stay tuned to local radio or television stations for emergency updates and instructions. If flooding is likely and time permits, move valuable household possessions to the upper floors of your home. If advised by local authorities to leave your home, move to a safe area before access is cut off by flood water. Before leaving, disconnect all electrical appliances, and if advised by your local utility, shut off electric circuits at the fuse panel and gas service at the meter. Do not turn gas or electricity back on yourself. Rely on utility crews. Do not use fresh or canned foods that have come in contact with flood waters. Follow local instructions regarding the safety of drinking water. If in doubt, boil or purify water before drinking. Have wells pumped out and the water tested before drinking. Avoid disaster areas; your presence could hamper rescue operations. Do not handle live electrical equipment in wet areas. Have equipment checked that has come in contact with water before you use it. 6. Avoid downed power lines and broken gas lines and report them. Use flashlights -– NOT lanterns, matches, or candles -- to examine buildings. Stayed tuned to radio or television for information and instructions from local authorities. 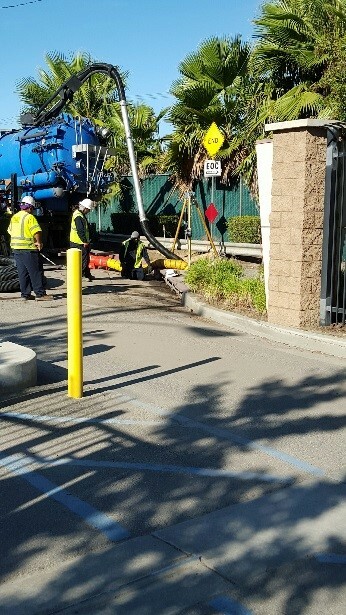 The City of Riverside operates Emergency Sandbag pick-up sites throughout the winter months in anticipation of continuous and extended heavy rainfall events during which widespread flooding may occur. Sand and sandbags are available to property owners and local businesses on a self-serve basis. Property owners and businesses are requested to take no more than 20 sandbags. These sandbags are not intended for commercial ventures or builders involved in new construction or development. Prepare ahead of the storm, sandbags and sand are available, inexpensively, at most hardware and home improvement stores. Flash floods kill over 200 people annually in the U.S. and trap thousands more, jeopardizing the safety of both civilians and professional rescuers. 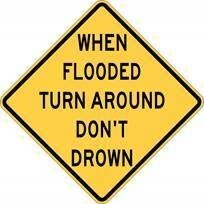 Turn Around, Don’t Drown! If flash flooding has already started, evacuate immediately. You may have only seconds to escape. Act quickly! City Office of Emergency Mgmt. Subscribe to City of Riverside Emergency Notifications.